A project is the files that Visual Paradigm use to store diagrams and model data. The file extension is .vpp and .vux, such as ComputerSales.vpp and ComputerSales.vux. The .vpp and .vux file are working in pair to store the model information. You can create a project file (.vpp) in Visual Paradigm the way you would create a file (.doc) in Microsoft Word. You can name the project when you save it. You don’t need to create the .vux file manually. When you save your project to .vpp, the related .vux file will automatically being created. However, there is an exception for running Visual Paradigm inside and integrated IDE – their default project file is stored under the %IDE_project%/vpproject folder. So when you create a project for the first time before starting Visual Paradigm in your IDE, you will be asked to select a project path. From now on, the project will be attached to the specific workspace under IDE. Next time when you reopen the Visual Paradigm in IDE, you won’t have to select a project path. Auto-save saves the project currently open from time to time on its own. It helps to avoid losing project data when your machine crashes between saves or hit a power outage suddenly. You can find the autosave file under the workspace/.vpprefdata folder. Next time when you restart your Visual Paradigm after an abnormal closing of the program, a dialog box will open to ask if you want to recover your project file from the autosave file. If you chose to recover your project by clicking “Yes,” save the project manually after the recovery. It is recommended to save to replace the original .vpp file. This is particularly important for users who use the team collaboration feature. If you do a “Save As” and save it under another filename instead, the team collaboration feature may not function properly. By default, auto-backup will be produced automatically when you save your project. It offers a means to recover your previous work after you’ve saved your project and exited the application. In case you have made some undesired modifications on your project (which have already been saved at this point and cannot undo within the application), you can use the restore procedure to cover your work from the backup file. 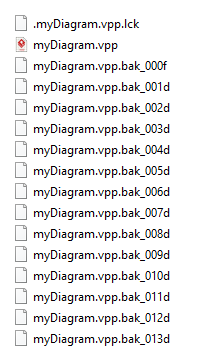 The backup file is usually saved under the same directory where you would find your original .vpp project. The name of the backup file starts with that of your project file, followed by .bak_XXXf or .bak_XXXd. Select General > Environment and turn on Advanced UI mode. Go to Help > Maintenance > Restore Auto Save. Select the project file (.vpp) which you would like to restore its auto-backup and press Open to proceed. Once the process completes the auto-backup will be saved to the folder named as %project_name%.vpp_restored. Thank you for your message. Since 13.2, the backup level option is removed. Now the backup is changed to incremental. We will update this knowhow soon. So, how I can set limit of backups or shut down this function? In new version, the backup is integrated into save feature. There is no need to limit the backup and no need to turn off and that will not have performance impact. the files we created is a delta (very small) and will cleanup for for certain no of save. I have Visual Paradigm CE version 14.1. At every saving it create new backup file. There are may files. How to turn off this option? It’s very annoying. The issue that I have with the backup files is that they are being picked up by my version control system. Because the extension is always changing, I can’t write an exclusion. I’m sorry that currently we do not have options to control the number of backup files it generated. In fact it will only keep 30 files for each project as it s backup. We recommend user to keep them all to avoid any issues. i.e. your machine being crashed.